MI6, CIA and Department of Justice Tango Down ! Hacker group Anonymous claimed it took down the CIA website for the second time in two months following a new DDoS attack on the U.S. secret service which lasted 45 minutes. 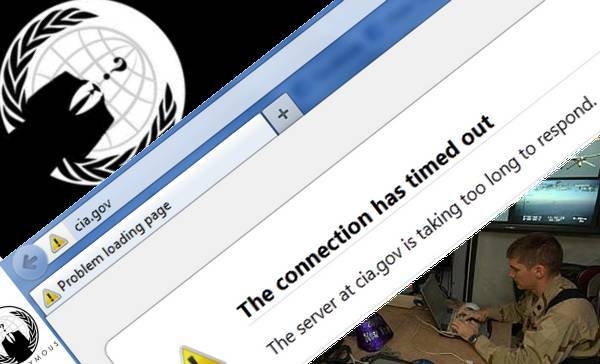 Anonymous is reportedly on a DDoS rampage today, downing the CIA, Department of Justice, and two Mi6 websites. Members of the group claimed responsibility throughout Facebook and Twitter. Brazilian hacktivist Havittaja reportedly launched the initial offensive on the DoJ and CIA for “lulz” while other members jumped on board a short time later. The technique also known as a DDoS (distributed denial-of-service) attack, is a concentrated effort by multiple individuals to make a network busy to its intended users. The end result is server overload. Anonymous makes a freeware tool available to its members to carry out these attacks, which it calls the Low Orbit Ion Cannon.